Get our 6-part course delivered to your in-box absolutely free. Plus, keep up-to-date on the latest Riff-On contests and more. ...we check their blogs for good posts to Riff on in return (a.k.a. "Riffback"). Read more about Blog Riffing on my other blog. 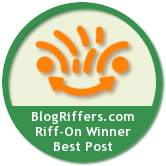 The Riff-On Contest: Blogging for Bragging Rights! With a post and tweet, win the right to plaster this badge all over one of your blog posts (plus, have some fun, write some good content for your blog, make some connections...and win other prizes). Enter our regular Blog Riffing contests. We'll pick a post from some blog, and everybody will grab a quote from it and use it as the seed for a post on their own blog. A day or two later, we'll pick the best post as the winner. Get in on the contest early, while there's less competition, and win the right to show our badge on your winning post forever. Check out the response I got when I introduced the Blog Riffing method.